Remember a few months ago we were all posting the #nomakeupselfie to raise awareness and funds for breast cancer? Well I’ve got a new one for you, and you’re going to love it. Macmillan Cancer Support is a charity that provides support for any one diagnosed with cancer. From talking about the impact it will have on your family, to the cost implications right through to the things you just can’t talk about with anyone else, Macmillan have been there for thousands of people at this most difficult and life changing time. As they say, no one should face cancer alone. The statistics are scary. Every two minutes someone in the UK is diagnosed with cancer. More than 1 in 3 people in the UK will develop some form of cancer in their lifetime. So now it’s time for us to get involved and show our support. The week of 19th – 25th July is officially Shave or Style week. If you’re brave enough, shave your head, but first, sign up to www.shaveorstyle.org.uk to set up your fund-raising page, get sponsored and get shaving! If, like me, shaving’s not your thing, try a new style. 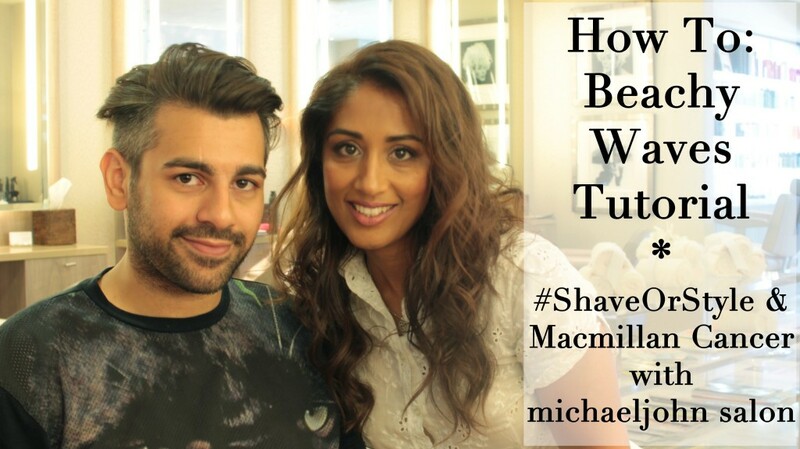 I spent a morning with the very lovely Imran at the fabulous michaeljohn salon in Knightsbridge to try a new style, (learning how to do it myself), so I thought I’d make a video for you guys. Copy my attempt, or do something completely different, and post a selfie on your social media channels. Mention @shaveorstyle, and make sure to donate £3 to MACMILLAN CANCER by texting STYLE to 70550 to help this utterly necessary charity to continue the indispensable work they do. Don’t forget to tag your friends to do the same! If you want to see my Shave or Style selfie, it’s here on my Instagram page and here on my Facebook page. Stay tuned and subscribe to my channel here for the second video coming later this week, taking this daytime easy relaxed look through to an easy evening look – both looks are perfect for that laid-back summer holiday feel. Oh, and don’t forget to tag me in your pics – I’d love to see your styles; I’m always looking for hairstyle inspiration! Next Post My Favourite Hair Oil Treatment…Ever!